Recently, I stumbled across a blog with the words "truth" and "bird" in the title. The page on my screen was beautiful and artistic, the colors and swirls all working together to lull the senses. The words themselves were poignant, alluring. But the truth is ... she had me at "bird." There was a picture of the author and she was formidable. Yes, that’s what I mean. She was wearing rugged boots and a straw hat with feathers and bits of turquoise in its band. She had hippy hair and strong hands. This chic looked as if she could knock down an oak tree - with her thumb - and then whittle it into enough shoes for her entire village. Whittle it with her teeth, I mean, and while the local wildlife gathered round and together they would sing Kumbayah. That kind of formidable. I want to be just. like. her. Lucky for me, it seemed, she was offering that very possibility. Were I to join her for an exciting, affordable, easy-to-follow course, why then! I could expect to finish as a brand new girl. I’d fully develop my creativity, tapping into my given giftedness. I would never waste time again because I would capture each day and woo it to be mine. I would make my own paper as well as the thoughtful gifts around which to wrap it. And through this process, my spirit could become free. My soul could be restored. Uh, pump the brakes please. There’s a lot of stuff for sale out there. Whether we’re looking to improve our poor time management skills, develop our creativity, or simply garner some self-esteem, the desire to self-improve is not wrong in and of itself. It is critical, however, that we aim for purity in the motivation. And after that, great care should be practiced when choosing our instructors. How many times did Jesus say, "I tell you the truth..."? Who better to guide me? "Teach me your ways, O LORD, that I may live according to your truth! Grant me purity of heart, so that I may honor you." Psalm 86:11 (NLT). What purer a motive could there be than to want to honor Jesus Christ in all that I do? "There are different kinds of spiritual gifts, but the same Spirit is the source of them all." 1 Corinthians 12:4 (NLT). How better to develop my giftedness than to seek the Source? "Greater love has no one than this, than to lay down one’s life for his friends." John 15:13 (NKJ). His love wins. "We escaped like a bird from a hunter’s trap. The trap is broken, and we are free!" Psalm 124:7 (NLT). 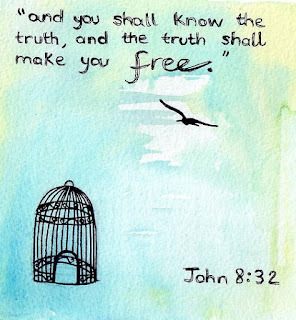 The truth is that I’m already free as a bird. Because I’ve accepted His offer. 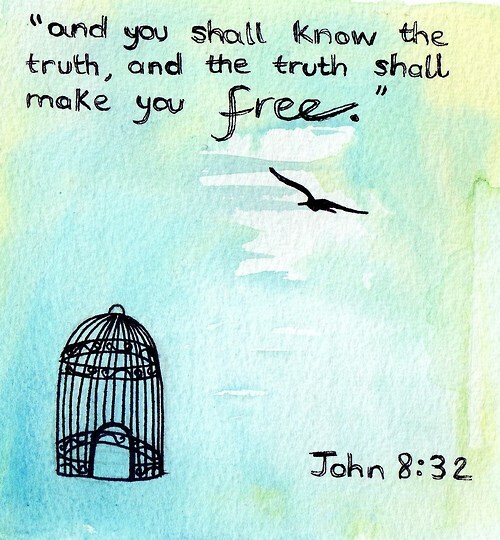 And His is free to all who simply ask. Dear God, thank You for loving us, for leading us, for freeing us. Thank You for Your words of Truth. I pray that You will purify our hearts and help us to want - more than anything else - to be just. like. Jesus.